Brooklyn designer Ilana Kohn skated competitively throughout the '90s. If you'd rather be wearing JNCOs and tall tees, but sometimes have to report to your office, an OkayCupid date or something fancier, her clothes—tomboyish and roomy, but smartly draped—may come as a relief. 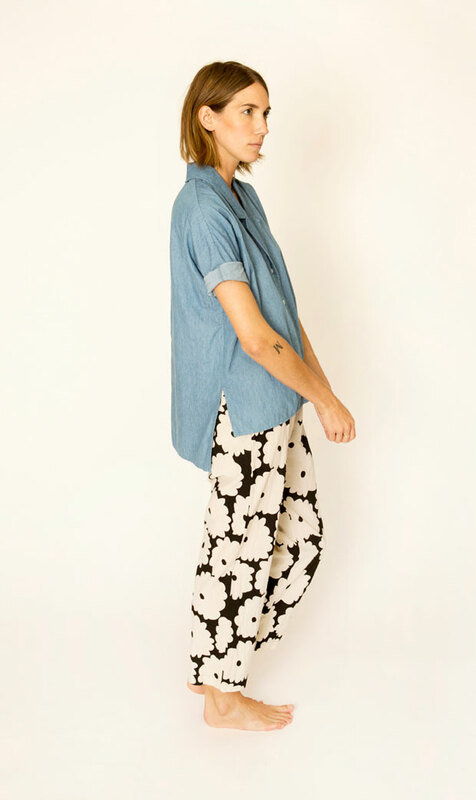 Here's a first look at her Spring/Summer 2014 collection, featuring tanks, tee dresses, straightforward pants and blouses with clever slits and flattering cuts, rendered in a bouquet of silky prints Kohn designed herself. Look forward to these as we barrel toward next year—for now, shop Kohn's fall line of equally easy-chic jumpers and cardigans. Above: Jewlery BRVTVS; Styling, hair and makeup Ilana Kohn and Caroline Ventura.